Truck Salvage Sydney specialize in the dismantling and recycling of heavy commercial trucks, lorriesand 4×4 vehicles. As a major Sydney truck dismantler and recycler we stock a huge selection of quality and competitively priced commercial vehicles, all ready for immediate sale. Our trained sales staff provide full and accurate information on all of our commercial vehicles and as we supply lorry and truck parts to Sydney, New South Wales and Australia destinations, you can contact us and request more images should you require to see something specific on the vehicle. Our Yennora based yard stocks heavy trucks from 3.5 ton such as the DAF45, Mercedes 814 and Ford Iveco, Hino, Nisssan diesel, Mitsubishi, Isuzu all the way up to maximum weight vehicles like the Volvo FH12, Mercedes Actros, and DAF XF 430. We currently process all vehicles on-site and can provide spare parts requirements such as trailer axles, cabs, engines, gearboxes and much more … We break all brands (MAN, Leyland, Daf, Iveco, Renault, Mercedes, Volvo, Scania, Mitsubishi, etc. 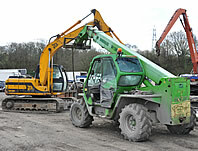 )… Contact us now with your heavy lorry and plant requirements. At Top Cash for Trucks we are always looking to buy salvage trucks, trailers, surplus parts, and used trucks. For all makes and models, we have a wide selection of new, used, surplus, rebuilt, after market, re-manufactured, reconditioned, and OEM parts at an unbeatable price with quality service that you can depend on. Have a trade proposal? Just ask! We will trade cash for unwanted trucks. Heavy Truck Vehicle Dismantlers for Salvage. We ship truck parts to Dubai and Worldwide destinations . Large selection of used truck cabs ready to fit plus some damaged cabs suitable for salvage. Used damaged and undamaged truck trailers – axles, wheels, landing legs, running gear and air valves. We dismantle all kinds of heavy plant and farm machinery. Huge range of 4×4 vehicles for salvage, or breaking for parts. All makes and models available. Find your local truck salvage: Paramatta truck wreckers, Wollongong truck wreckers, Newcastle truck wreckers, Canberra truck wreckers. This entry was posted in scrap trucks NSW and tagged american truck salvage, commercial truck salvage, Damaged Truck Salvage Sydney, fleet truck salvage sydney, Isuzu Truck Salvage Sydney, japanese truck salvage, salvage trucks buyer in Syndey, Truck breakers, truck dismanters, Truck dismantlers, Truck Salvage Company, Truck Salvage Sydney, Truck Salvage Value, truck salvage west sydney, Truck Salvage Yard, truck salvage yennora, Truck scrap yard, truck wrecking yard yennora on November 2, 2016 by Topcash.